Do you ever worry that when you go on holiday, you won’t be able to count the carbs correctly? Many can fear hypos and hypers and I was just the same before my first trip. My first solo adventure was to Paris, so I was entering the world of delicious pastries and croissants, which aren’t known for their low carb quantity! Most people learn how to carbohydrate count whenever they take a course before using an insulin pump. I did the DAFNE course when I was 17 and it transformed my diabetes control. 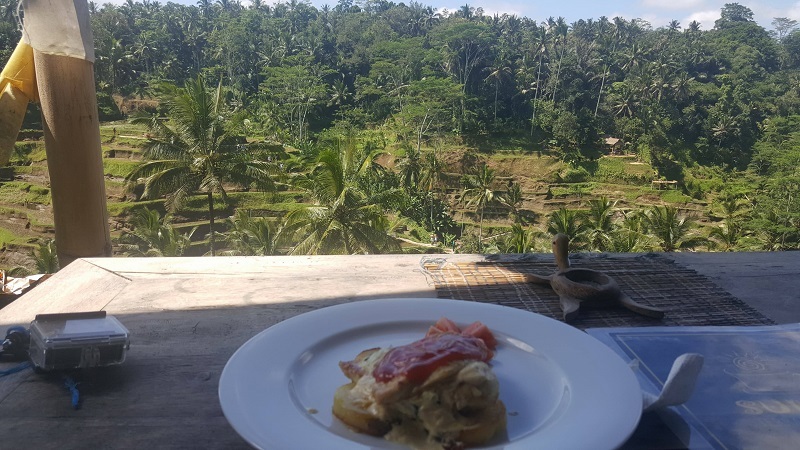 So I thought I’d do a little post comparing my diet at home to when I am on the road and some tips I’ve learnt along with the way about dealing with counting carbs abroad with diabetes. One of my favourites- chicken noodle soup! What do I eat at home? I generally follow a low-carb diet. This is both for diabetes and just my general health. I find I am healthier when I am not fully carbed up (I don't think that's an actual word) and it certainly helps with my diabetes management and means when I do eat carbs, I can usually master the dosage quite well! (most times). I avoid rice like the plague and I rarely eat pasta or pizza (unless I am in Italy of course!) I don’t eat fruit unless it's for a hypo treatment and I get my 5-a-day via vegetables. I like my diet because I love protein and I’d much rather have a plate of cheese than a bar of chocolate! What do I eat when travelling? When I did my first long-term travel trip to South America, I changed my diet to suit what foods were available and cheapest to me. South America was far too expensive to eat out, so we rarely did which meant that 98% of the time we had to cook on a budget. This meant I was eating a lot of tuna pasta and potatoes. I soon realised that this didn't work for me. 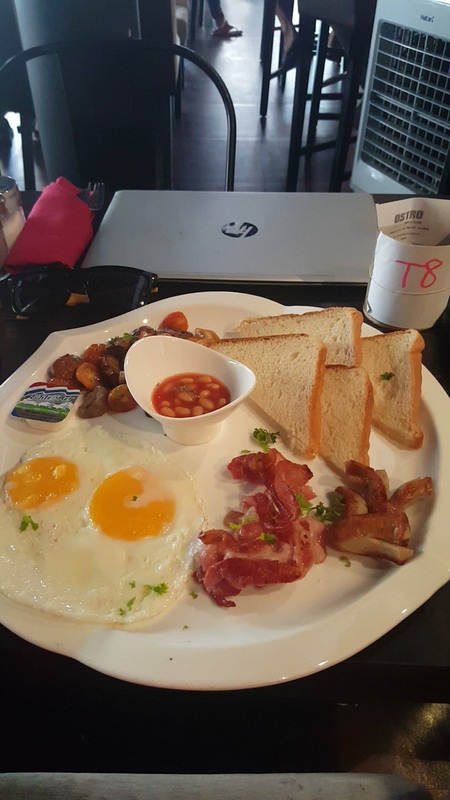 I was feeling sluggish and tired and eating carbs along with the changes in altitude, temperatures and general stress of travelling, was not great for my blood sugars. So, I decided that since I had control over what I was cooking, I replaced all the pasta and potatoes with lettuce. Whilst it may seem a little boring, it worked for me. 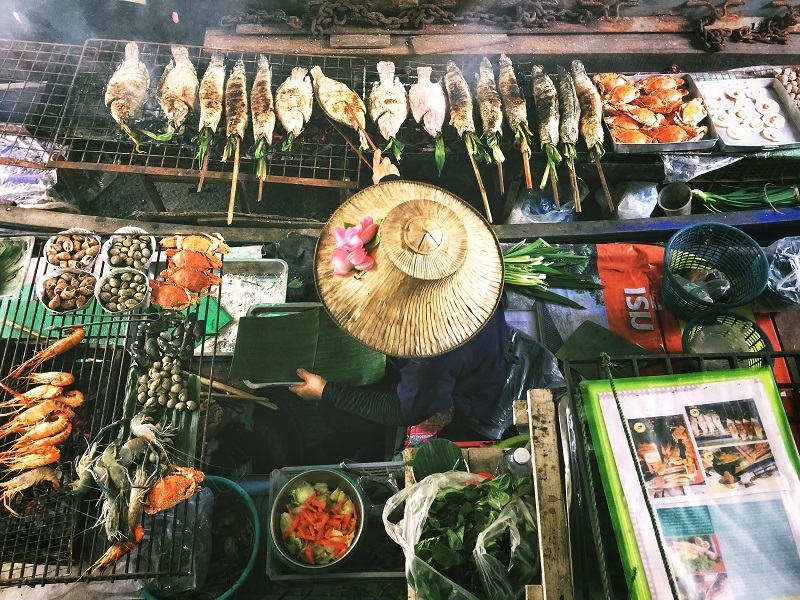 I did, of course, try local foods and street foods when we had access to it, but when you’re on the road for so long, you have to make choices to find a diet and food balance that suits you, otherwise, your body just gets confused. Cooking at home meant I could carb count easily. When in Asia, I found myself eating more noodles. I actually enjoy noodles, they don’t mess with my blood sugars and they’re filling. 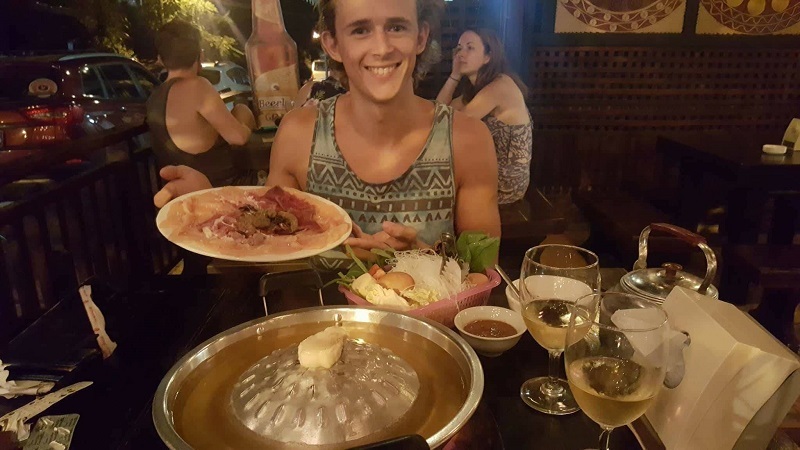 In Asia, we ate out every single night for three and a half months, apart from one evening because it’s so cheap. So I really had to make conscious decisions about what I was eating. I tried to stick to low-carb when I could, so having just eggs for breakfast, a salad for lunch, and then a decent dinner. Sometimes Brad and I would skip lunch or a snack instead, as we liked to spend the money we saved on lunch on a really decent dinner! When eating out this cheap...you have too! How do I count carbs when travelling? Practice, practice and more practice. I’m at the stage of my life that I don’t need visual representations or even food packaging to work out the carbohydrates in foods. I’ve memorised them all and anything I haven’t seen before, I can usually compare it to a similar food. This didn’t happen overnight and these are some of the things I did to help with carb counting abroad. Available in App form too! I was given a copy of this book when I took my carb counting course and it’s fantastic. 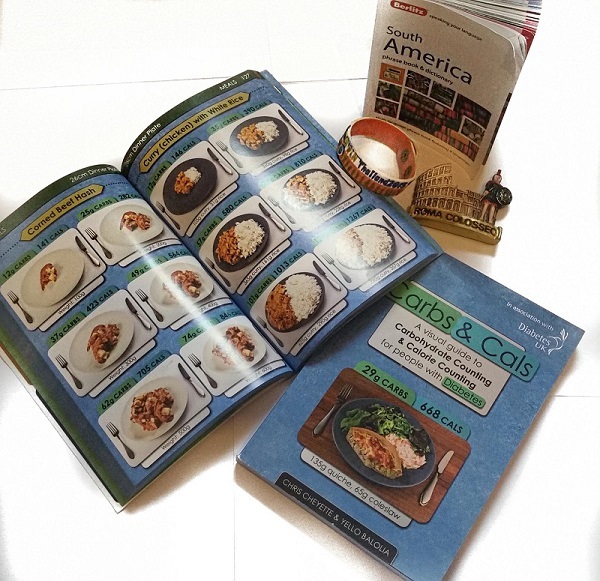 It’s a book filled with different foods, corresponding sample sizes and the estimated carbs. It’s only an estimation, but it’s super useful when you are dining out and don’t know what is in your food. There is also an app now, so you really don’t need to carry a book around. If you’re at a restaurant and have been served something, simply look at what’s on your plate and check the app to get a rough idea of what your carbohydrate count it. Of course, final insulin doses are based on more than carbs, but this helps with the initial guesswork. I remember when I was at university I loved Costa Coffee and my signature drink was a “skinny-sugar-free caramel latte”. I think there was a stage that I had one every day...then I got a job there and got them for free for a while! Despite my love for them, I could never get the carbohydrate count correct and I was usually going low or high because of my errors. I decided to nosy on their website one day and came across the nutritional information. They had all the estimated carbs per portion on there! I memorised this list and I now take this information and use it at other coffee stores and I could drink Costa and still have awesome blood sugars. The point is, that big chains usually have their nutritional information online, and there is no harm in popping into a McDonalds, or TGI Fridays when you’re travelling. Some restaurants will know the carbohydrate count of what they have produced, or simply have packaging or labels with information that could be useful to you. There is no harm in asking. Obviously when you are in a foreign restaurant and dining in a local cafe, then this may be a little less possible, but that is when your carbs & cals book helps, or any fitness app such as My Fitness Pal is great for telling you the carbs of both branded and non-branded food. Some food is much easier to carb count than others! 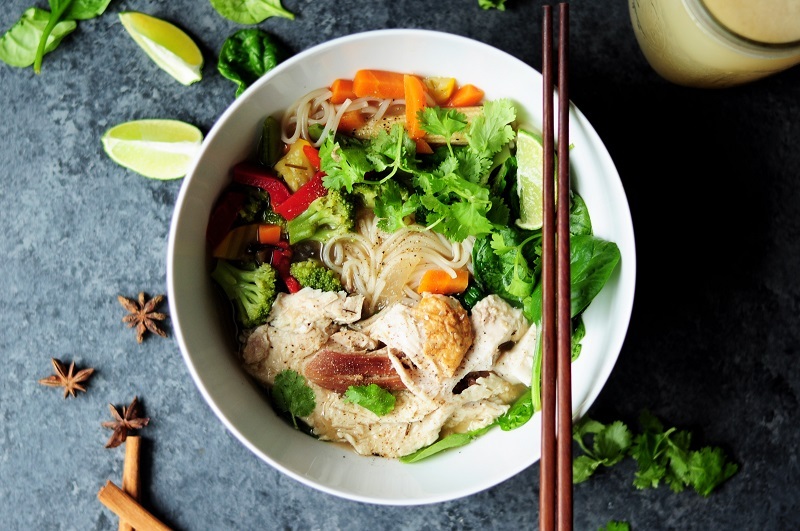 If you know you’re going to Asia for a couple of weeks, but have never really eaten rice noodles or glass noodles before, then why not do a few test runs at home. Create the dish at home with the portion size you wish and make note of what the carbs were and how much insulin you need. This will help you when it comes to the real thing. Plus you can practice cooking! Another handy tip is that if you are on a long-haul flight, you can usually find out the menu online (or request it) before you fly. You can, therefore, take what’s on the menu and work out an estimation of carbs so it doesn’t feel so daunting when they hand you a meal with no nutritional information. These are just some of the things I do to help with my carb counting abroad, but as time goes on you will realise you need to rely less and less on these above tips. You’ll not get it right every time, but you will get it right lots of times! If you are in doubt, stick to low carb foods. 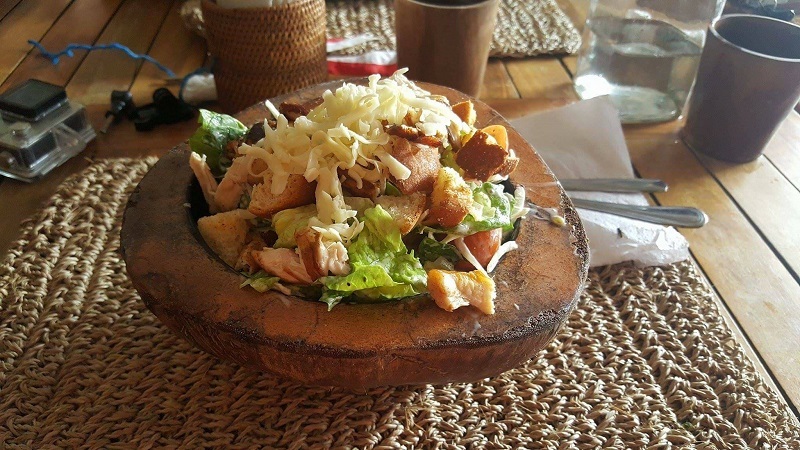 In chain restaurants you can usually replace chips and potatoes with salad or vegetable and with street food and local cafes, you can simply opt for lower carb choices. Asia is filled with chicken, beef and pork on a stick, sweetcorn, fried chicken and more. Low carb is great if you're nervous. I hope you find some of these tips useful for carb counting abroad! If you want further information or a full guide to travelling with t1d, then check out the complete E-book here.